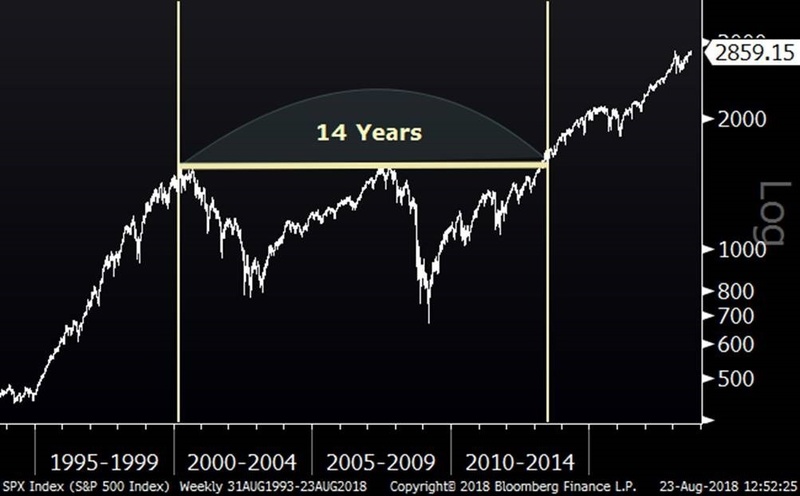 If we were to measure the duration of a bull market by the length of time from when it first makes new highs after a decline until the next 25% decline, we are currently about five years into the current one. Below are other periods of new market highs without a 25% decline looking back to the Great Depression. When viewed from this perspective, the duration of the current market strength does not seem anomalous. Further, one might argue that 1962 and 1987 were very short periods and not prolonged bear markets. If you were to throw those out, then there would be a 13-year period and an 18-year period. 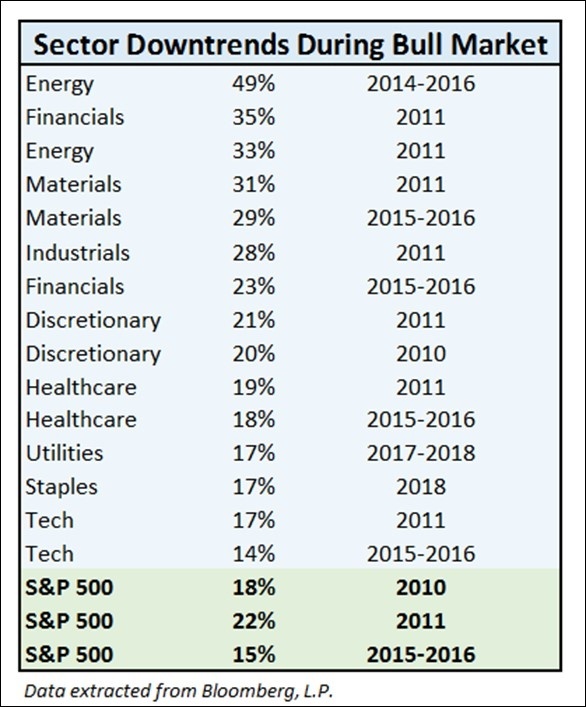 Within the current period since the 2009 bottom, while there may not have been a bear market as defined by the media, there have certainly been weak periods for sectors and the market. The chart below shows some of the more pronounced downturns since the 2009 market bottom. Essentially, strength in technology stocks has (barely) kept the S&P 500 from entering an official bear market. This is not surprising considering technology is the biggest sector and that we have been in the midst of a technology revolution where we have seen the emergence of companies like Apple, Google, Facebook, Amazon, Netflix and others. In the table below, I evaluated intraday highs and lows, which is why the change in the S&P 500 is greater than the arbitrary 20% bear market definition. To make a long story short, I am not buying into the idea that the period we have experienced since 2009 is as much of an anomaly as the media would lead us to believe. While there may be plenty of reasons to sell stocks or reduce equity exposure, the length of the current bull market is not one of them, in my opinion. I recently saw the chart below from an Economist.com tweet. 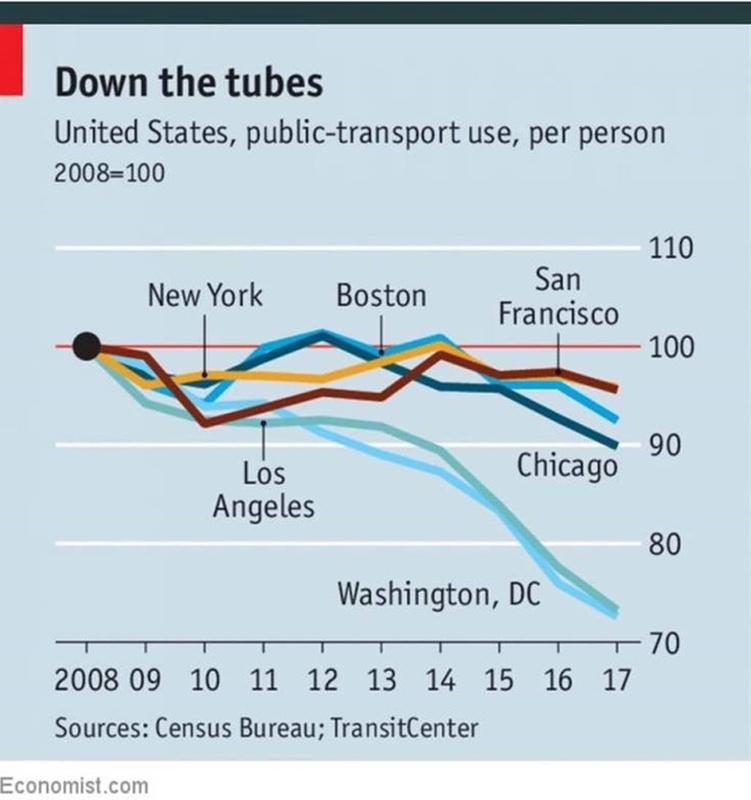 It is interesting how quickly some of these cities have seen a drop off in public transport use in just ten years. If Cleveland were on here, it would certainly be down-trending too. There is a debate on what is causing this and whether or not we should be investing more in traditional public transportation. What do you think?